HOW DOES IT WORK? It’s easy to use. It’s safe. the skipper is responsible for steering the boat safely, keeps an eye on other participants and follows the speed instructions of the guard. 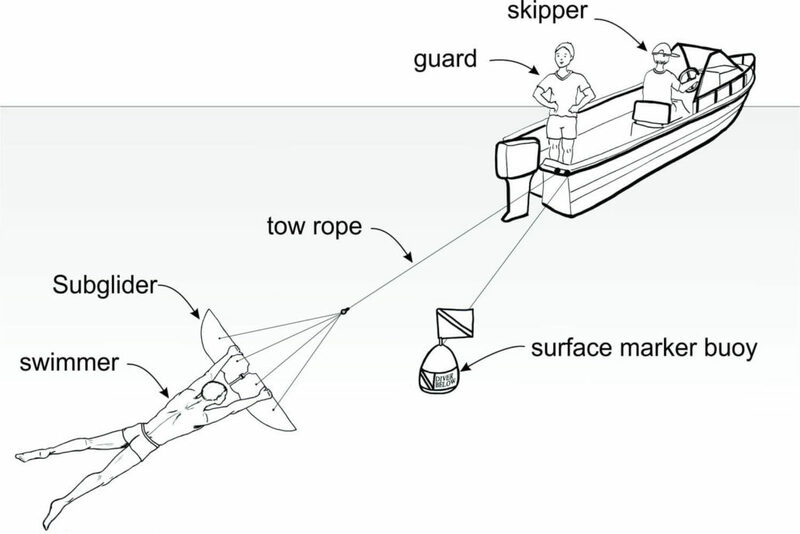 Preferably, the tow rope should be attached to the area behind the centre of the boat, as rope forces can affect the steerability of the boat when using Subglider. This does not pose a problem for small boats. However, if you use a small boat, we recommend that traction is directed directly to the centre of the boat, preventing traction from turning the boat in certain directions. This can be resolved by connecting the V-shaped branches of the rope to the sides of the boat and the tow rope to the centre. Traction will thus be focused on the area directly behind the boat. If you use a small boat (e.g. an inflatable boat), please note that the Subglider can significantly reduce its steerability. You should always use the included rope winder for winding and unwinding the rope. The 3mm rope can quickly get entangled if the winder is not used. Note: The original cord, which you have received when purchasing Subglider, is made for floating on the water. If you use cords from other manufacturers, make sure that they float. Most cords used in navigation do not float on the water. These are very dangerous and can get entangled in the propeller. If you use metal carabineers, do not forget to attach the float and make sure the carabineer does not sink. Hand signals are always necessary for coordination between the swimmer, the guard and the skipper. It is necessary to use the surface marker buoy, indicating that the swimmer is in the water. Tie the buoy to a slightly shorter cord than the one for the Subglider. For instance, if you have tied the Subglider to a 15m cord, tie the buoy to a 12m cord. The surface marker buoy warns other vessels about the diver in the water and improves security. You can go into and out of the water when the engine is switched off, thus preventing injuries. The swimmer must grab his or her Subglider and swim until the tow rope is tight enough. While the guard loosens the rope slowly, the swimmer must make sure the rope does not tangle around his or her body. When the swimmer is ready, you can start the engine and set off. When the swimmer is ready, he or she should give the guard a signal to set off. The guard communicates the swimmer’s signals to the skipper. The skipper must pay attention to steering the boat at all times. Reverse communication with the swimmer is dangerous and thus forbidden. The guard is the only one responsible for the communication between the swimmer and the skipper, as well as for the safety of navigation. He or she must observe other vessels and, if necessary, warn the swimmer in the water. The upturned Subglider allows the swimmer to dive easily and to maintain the depth of the dive. If you turn the Subglider over (white side up), you can rise up from the water easily. What is more, at a certain speed, the Subglider does not sink, but remains on the surface. The upturned Subglider does not sink at a speed of 2 knots or more. This is why you should never tow an “empty” Subglider, without the swimmer behind the boat. It can sink very deep and cause damage. The recommended see depth for the use of the Subglider is 4 to 10m. In shallow seas, the swimmer is in danger of touching the bottom. In the deep sea, there is an increased risk of large marine animals. Moreover, the swimmer could lose a sense of orientation due to the depth. When using the Subglider for the first time, start at the lowest speed (depending on the engine size) and slowly accelerate, allowing the person in the water to get familiar with the Subglider’s behaviour. The recommended towing speed for a Subglider is 3 knots. The sense of speed and the forces on the body are significantly increased under the water. Please bear in mind that a speed of more than 3 knots is considered high. High speed can cause injuries to the neck or other parts of the body. Do not make any spins or quick turns, unless you master the basics of rising up from the water and diving. When diving, simply direct the Subglider downward and hold its front edge firmly. The water flow will press the wings down. If you want to come back to the surface, do the opposite. Direct the wings up and water flow will push them upwards. Note: You can control the lifting and lowering speed by adjusting the angle at which you operate the wings. A wide angle will result in a stronger and quicker reaction, while a small angle will cause a slower reaction and a slower rise to the surface. If you want to spin around your axis, simply rotate the wings in opposite directions, one slightly up, the other slightly down. The Subglider will start turning by itself. If you hold the wings in this position for some time, you will start spinning around your axis. If you want to turn the wings only briefly, put them in the rotation position, level them and continue in the desired direction. Turning and rotating can only be carried out below the surface. There is a cord at the rear of the Subglider that can be used for performing acrobatics and balancing pressure. The cord enables you to hold the Subglider with one hand. This handhold is easy to use above the surface and allows you to relax or send signals with the other hand. Its use under the water is more difficult and requires some practice. When you hold the handhold with one hand, it is not possible to manoeuver. It is also impossible to rise to the surface. It is therefore very important to practice the transition between holding the handhold with one hand and holding the wings with both hands at low speed. The transition must be completed very quickly, otherwise the Subglider will turn to the side and you will lose control. We recommend that you use the Subglider to a maximum depth of 2.5m. If you ever feel like going deeper, you must equalize the pressure in your ears. It is recommended that you attend a free-diving course and learn how to equalize the pressure correctly. In any case, please note that the diving deeper than 2.5m carries an increased danger and risk.